Trump's second U.S. Supreme Court appointment, confirmed Saturday in razor-thin 50-48 vote, secures a solid conservative majority. But questions of partisanship and credibility will follow Kavanaugh as he takes the bench. 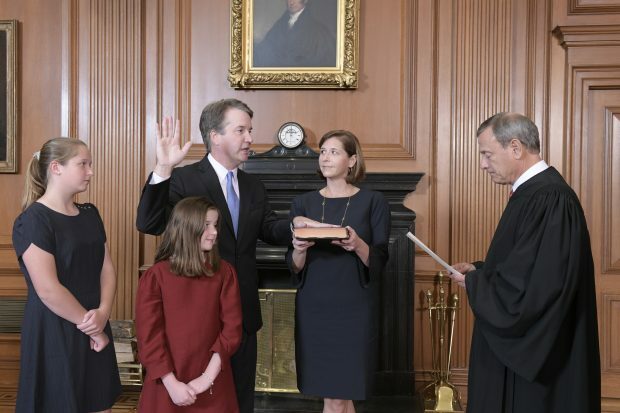 Chief Justice John G. Roberts, Jr., administers the Constitutional Oath to Judge Brett M. Kavanaugh in the Justices’ Conference Room, Supreme Court Building. Mrs. Ashley Kavanaugh holds the Bible.Credit: Fred Schilling, Collection of the Supreme Court of the United States. The U.S. Senate’s confirmation of Supreme Court nominee Brett Kavanaugh on Saturday, after an acrimonious fight over claims he committed sexual assault, lied about his drinking habits as a young adult and demonstrated unfit temperament in a partisan tirade directed at his opponents, marks a crowning achievement by conservatives to cement a solid 5-4 majority. "I am left to conclude that the entire council should be disqualified from participating in consideration of the current petitions for review," Judge Mary Beck Briscoe wrote in her dissent.